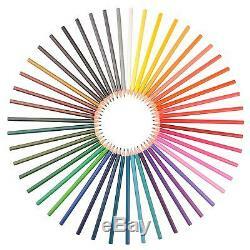 48 Set of Watercolour Pencils- Assorted Vibrant Colours, Used by Artists, Designers and Adult Colourists. Free Brush, Sharpener and Rubber. Strong Lead, Easy to Blend. SMOOTH COLORING AND EXTRA STRONG LEADS - This enables increased control and consistency. It has never been easier to achieve a wide range of shading effects, both subtle and bold. Enjoy the feel of our pencils as they glide easefully over paper, confident that no powder or residue will ever be left behind. FAST DRYING NON FADING HIGH PIGMENTATION - Water activates our colors, creating a stunning texture. Our pigment dries quickly and does not fade, allowing for a bold range of techniques. Embrace flexible blending and immediate layering, for your paintings. SEAMLESS BLENDING AND RICH VIBRANT COLORS - Known for their extremely high pigmentation, our rich colors continue to satisfy artists across the globe. The range of colors is outstanding, with each pigment blending seamlessly with its neighbouring hue. We spent a long time ensuring that are colors are both vivid and diverse, and we are confident that you will love them. Perfect for bringing flare to an adult coloring piece or a beautiful artwork. EXCEPTIONAL CUSTOMER SERVICE - Our customer's have come to expect an exacting quality from Original Stationery products, and our watercolor set will not disappoint. Working together with Corot you can trust our watercolors to perform at a professional level. Don't be fooled by cheap imitators, choose Original Stationery and attain the results that you deserve. 48 WATERCOLOR PENCILS BY ORIGINAL STATIONERY - Want to catch that sunset as it sinks behind the waves or perhaps you wish to immortalize the dazzling sights of a vibrant city scene? Stylish and easy to transport, you can enjoy our watercolors anywhere. Perfect for all general uses - Professional design, Adult Coloring, doodling and fine art. Highest quality watercolor pencils with amazing drawing quality Products Details. 48 Colors in a pack No repeats Arrives in a sturdy, well-constructed fabric wrap, perfect for storage and travel Long lasting with bright and vibrant colors Simple and fun to use, draw, add a small ammount of water with the brush to blend and create fine watercolor pieces Strong leads that don't damage easily Used by graphic designers, artists and professionals for their bold colors and high quality finish. So dont delay and grab a set of watercolors while stocks last. You may return items in its original condition within 30 days. The item "48 Set of Watercolour Pencils- Assorted Vibrant Colours Used by Artists Desig" is in sale since Sunday, April 16, 2017. This item is in the category "Crafts\Art Supplies\Drawing & Lettering Supplies\Art Pencils & Charcoal". The seller is "shop*zing" and is located in US. This item can be shipped to United States.